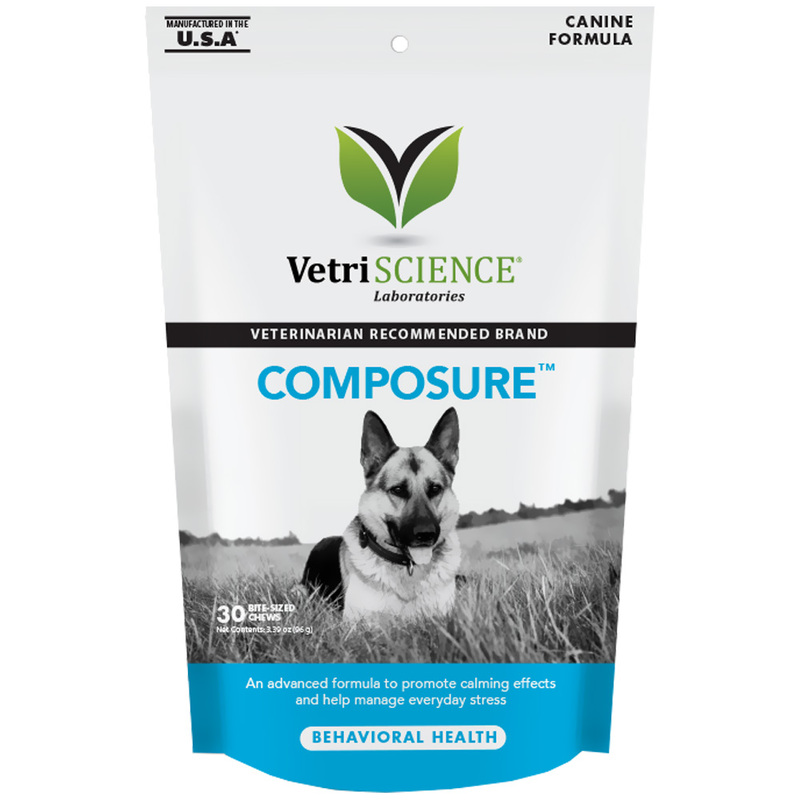 Composure Calming Support for Dogs provides the perfect way to calm canines that are entering a stressful situation or to manage everyday stress in an anxious pooch. This formulation combines L-Theanine to support calming and relaxation, Colostrum Calming Complex to support cognitive function and stress reduction, and Thiamine to reduce muscle spasms and mental confusion. Composure Calming Support for Dogs is manufactured in the USA for all weight ranges of dogs. This bag includes 30 bite-sized chews and is resealable to preserve their freshness. If you're looking for a way to calm your nervous pup then look no further- grab a bag of Composure chews today! C3™ is a Trademark of VetriScience® Laboratories, a division of FoodScience® Corporation. Copyright © Foodscience® Cooporation 2009, Essex Jct, Vermont, 05452. For use in dogs only. Product can be given daily or on an as-needed basis. It is safe to double or triple the dose in times of increased stress. Cautions: Safe use in pregnant animals intended for breeding has not been proven. If animal's condition worsens or does not improve, stop product administration and consult your veterinarian. Warnings: For animal use only. Keep out of reach of children and animals. Some pets may consider this a treat. In case of accidental overdose, contact a health professional immediately.